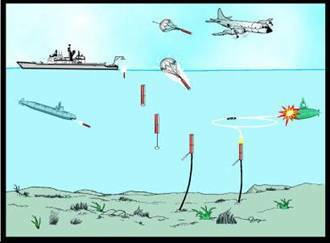 When countries are at war, they sometimes lay mines in the ocean, hoping to sink enemy ships that hit the mines. 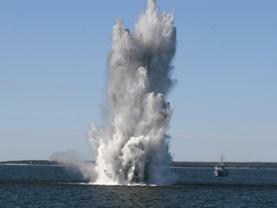 The mines may be laid from ships or submarines, or even dropped into the ocean from aeroplanes. The mines can be hidden under the ocean, or left floating on the surface, like this one. If a ship hits a mine and breaks one of those spikes - BOOM! If a mine explodes, there probably won’t be much of the ship left – compare the size of the mine explosion with the size of the ship in the picture above. 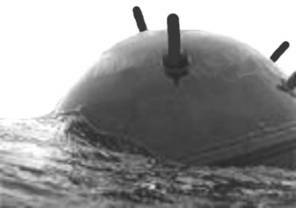 A minesweeper has the very dangerous job of travelling around an area of ocean known to contain mines, locating them without setting them off. Real minesweeping sounds rather dangerous, so let us try some Robot Minesweeping, it is probably safer. Also, the Headmaster might be rather upset if we brought real mines into the School, so let us use red plastic cups to represent the mines. We will start off with three red mines in our black ocean, and increase the number if we want to make the task more difficult. Our task will be to teach our Robot Minesweeper to take a voyage around the ocean without blowing itself to bits by bumping into a mine. Somehow we have to give our robot enough intelligence to survive for 2 minutes in these hazardous waters! Where Do We Place the Mines? Each mine sits on a yellow circle. Talk to your teacher and decide before Robot Minesweeper voyages where in the black ocean the yellow mine sites are to be placed. 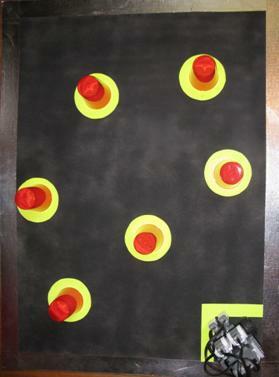 Then place the red mines in the middle of each yellow circle. The bigger you build your Robot Minesweeper, the bigger the chance it will hit a mine – so it is a very good idea to make it as small as you can. If you still have the small Robots you used in Challenges 16 or 48, they could be a good place to start. We will not stick to official rules of Robot Minesweeping (to see these go to http://www.robotgames.net/WCRG/pdf/rulebook2004.pdf page 9). Let us start our Robot voyages from the bottom right-hand corner of the ocean shown above. Your Robot will aim to survive 2 minutes without being blown up by hitting a mine. Or: Your minesweeper will only be blown up if a red mine is pushed outside its yellow circle. When your Robot sets off a mine, it is blown up and sinks. That is the end of that voyage! Discuss how you like to score these voyages with your mentor or teacher. Together, you can change any of these rules any way you like, you can even make up rules that are completely your own – the main purpose is to have fun while learning about robotics! If you need more help about how to teach your Robot, click here. Think about how you want your Robot Minesweeper to avoid the mines. What is the easiest way to instruct your robot to keep away from them? What should your Robot do if it detects a mine? What would be the best way to detect a mine? Which sensor would be best? Would your robot need more than one sensor, or would just one be best? Is the easiest way the best way, or is some more complicated way better? Agree before the Robot Minesweeper voyages where to place the mines. If several Robot Minesweeper Robots are competing against each other, the mines should be in the same position as each different Robot minesweeper makes their perilous voyage. The best Robot could be the one that lasts the full 2 minutes without being blown up and sunk. If more than one robot last the full 2 minutes, the result is a draw. If the best robot can not be decided after 2 rounds of a minesweeping contest, a third minesweeping contest with a longer time limit could be held, with the Robot that voyages for the longest time being considered the best Robot Minesweeper. If more than one robot last more than, say, 4 minutes, the contest could be declared a draw. Robots Minesweepers must keep moving – A Robot Minesweeper that just moves outside the starting square and sits there for 2 minutes will not be able to find any mines and hence that run will not be counted. Go build your Robot minesweeper! Mentor note: You can get construction details of the arena used in this Challenge by clicking here.